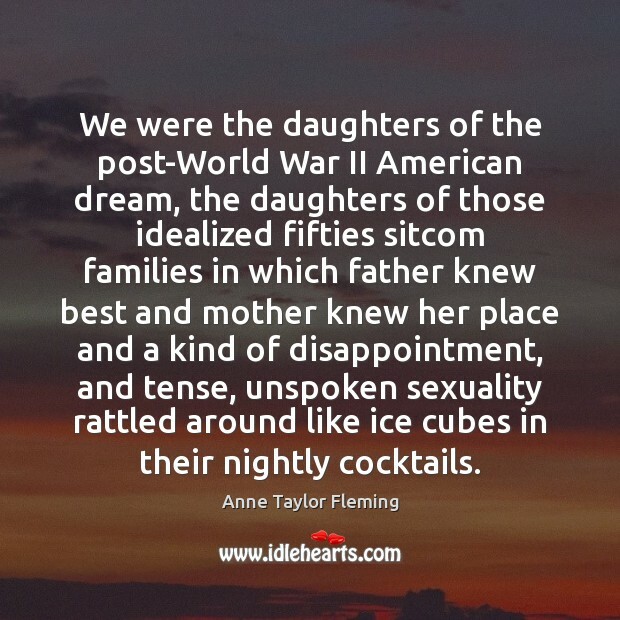 Enjoy the best inspirational, motivational, positive, funny and famous quotes by Anne Taylor Fleming. Use words and picture quotations to push forward and inspire you keep going in life! It was a lot to carry out of a childhood--all those textured layers of thwarted dreams rumbling under the fifties patina--but a lot of us did it. In those manicured lives and choreographed marriages there was an often-pronounced loneliness, an emptiness that we would try to fill with our own accomplishments. 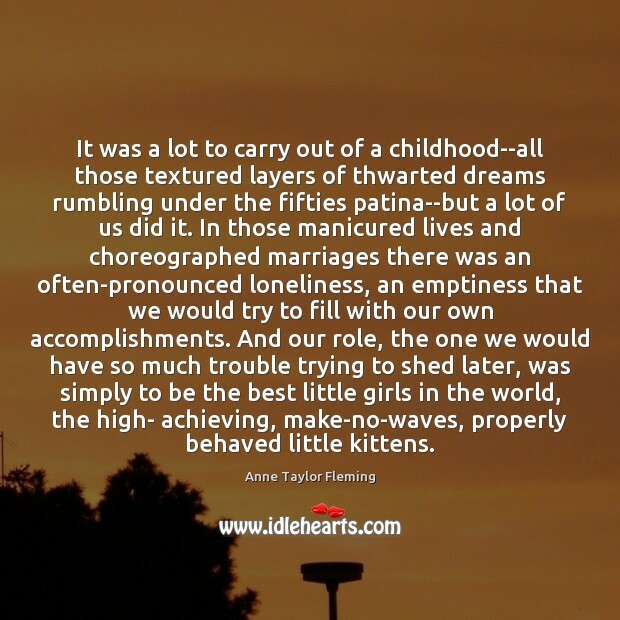 And our role, the one we would have so much trouble trying to shed later, was simply to be the best little girls in the world, the high- achieving, make-no-waves, properly behaved little kittens. That, of course, was the thing about the fifties with all their patina of familial bliss: A lot of the memories were not happy, not mine, not my friends'. 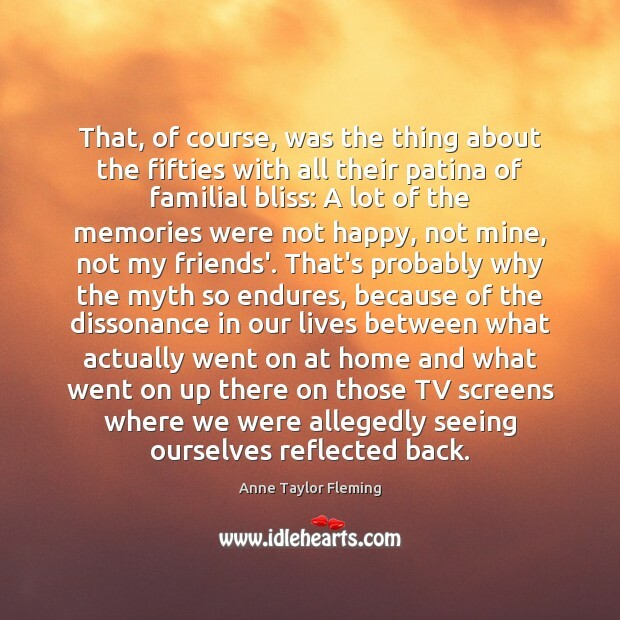 That's probably why the myth so endures, because of the dissonance in our lives between what actually went on at home and what went on up there on those TV screens where we were allegedly seeing ourselves reflected back. 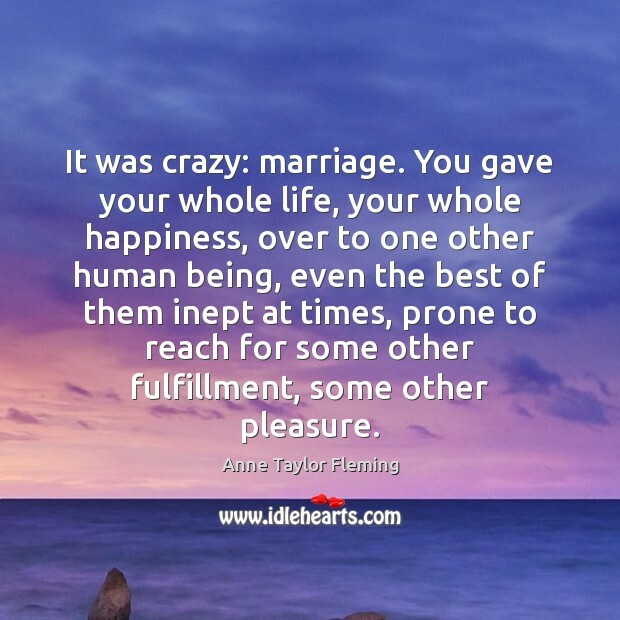 It was crazy: marriage. You gave your whole life, your whole happiness, over to one other human being, even the best of them inept at times, prone to reach for some other fulfillment, some other pleasure. 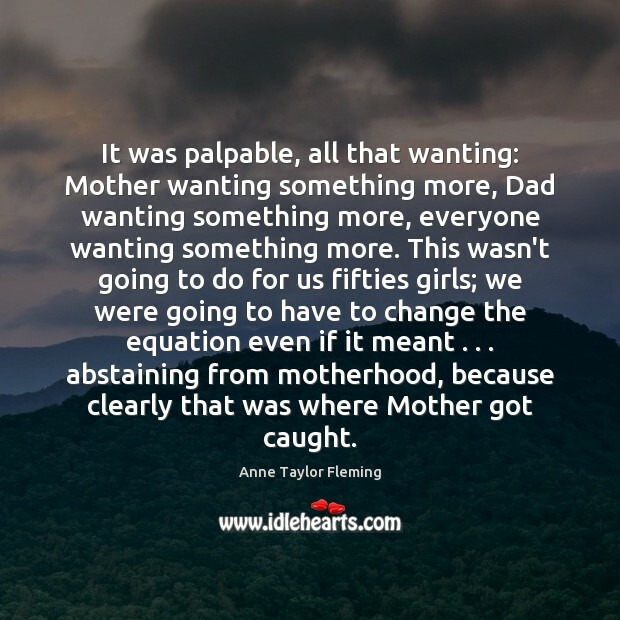 It was palpable, all that wanting: Mother wanting something more, Dad wanting something more, everyone wanting something more. This wasn't going to do for us fifties girls; we were going to have to change the equation even if it meant . 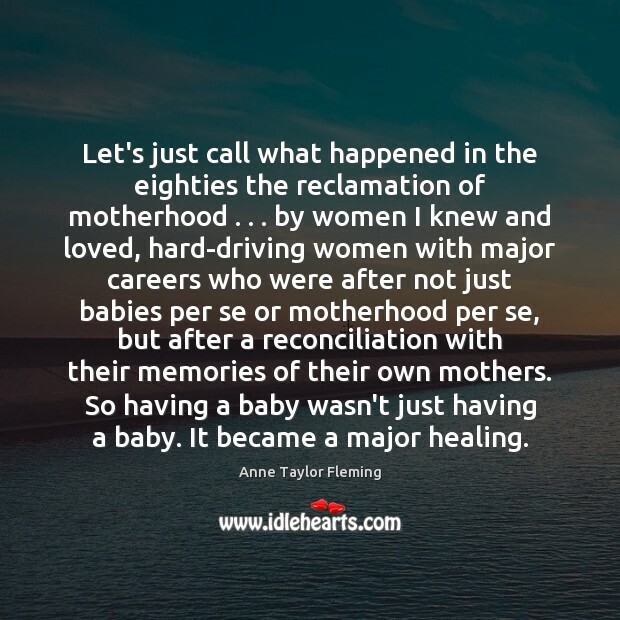 . . abstaining from motherhood, because clearly that was where Mother got caught. 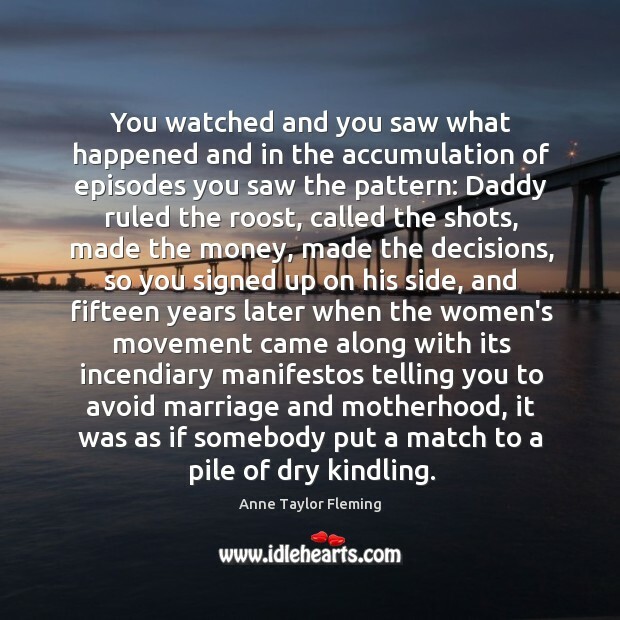 You watched and you saw what happened and in the accumulation of episodes you saw the pattern: Daddy ruled the roost, called the shots, made the money, made the decisions, so you signed up on his side, and fifteen years later when the women's movement came along with its incendiary manifestos telling you to avoid marriage and motherhood, it was as if somebody put a match to a pile of dry kindling.